Perhaps there is a time when it has crossed your mind to question the type of relationship that you have with your partner. Certainly, with the way relationships are handled these days, it is imperative to find out more about the affair that you are involved in. In this case, you would have to consider whether you are just friends, affectionate, long term lovers meant for marriage etc. This information can be summarized through the use of the FLAMES Love Test. 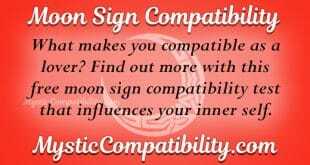 From the above, love compatibility with your partner can be identified through the flames love test. The results that you obtain from the calculator will reveal whether your relationship is the affectionate type or the marriage type. In this case, if your love affair falls under the siblings category, this would mean that there is a lot that you need to do for your relationship to thrive. The meaning of some of the results based on FLAMES love test are briefly described below. If your flames love test results come out as F for Friendship, this would mean that your relationship is mostly on a plateau. These are the type of relationships that are normally stuck on the friends zone. Certainly, it is normally difficult to come out of these zones without appearing as though you have misplaced your priorities. Lovers in such an affair as advised to switch back to the drawing board and try to find out what actually went wrong. 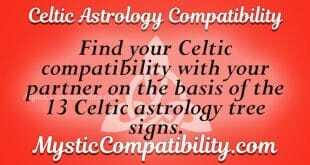 Just as the name love compatibility suggests, this result would indicate that you are indeed a true match with your lover. This relationship compatibility is destined to thrive in the long run. However, this does not necessarily mean that you ignore the idea of showing concessions in your love match. There is still a need to bend a little and appreciate each other’s efforts in this love affair. If your partner keeps mentioning that “I like you” or just affection then you need to be wary about such type of a relationship. This result of the FLAMES love test could indicate that your partners are too fond of you to the extent that they see nothing beyond the plain friendship that you have. Correct this as soon as possible to guarantee that they call you the names that you deserve such as darling, sweetheart, honey and many more. Longevity is what defines this type of a marriage relationship. 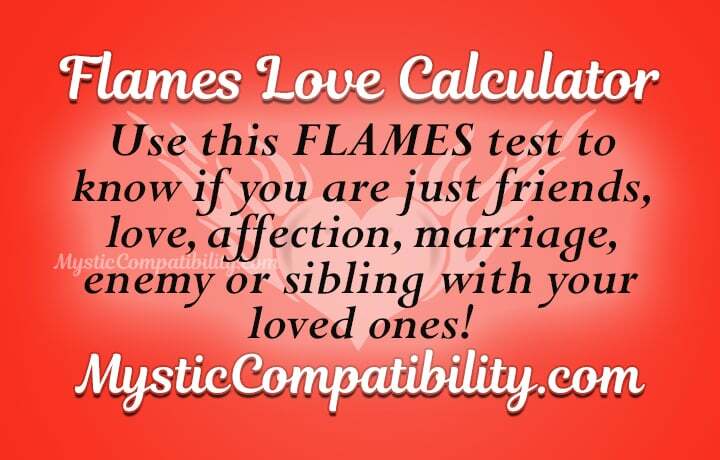 The results that you obtain from the flames love test indicate that you are fated for each other. There is no resisting the chemistry that keeps pulling both of you closer to each other. The best thing about this type of a relationship is that, both of you are always there for each other. Results indicating that both of you are enemies implies that you need to call it quits. If both of you are compromising enough, then there is a need to bend a little and give your love another chance. This might sound like a loving relationship. Well, surprisingly, it is not. Lovers in this match simply consider each other like a brother and sister. The woman would expect the man to always be there for them in times of need. At the same time, the man expects the woman to provide a shoulder to lean on. There is no crossing of each other’s boundaries in such love affair. If you are in this sort of a relationship, you need to be careful with how you approach delicate situations in this match. Understanding your relationship is a crucial aspect that gives you a sense of belonging to the partner that you want to spend the rest of your life with. 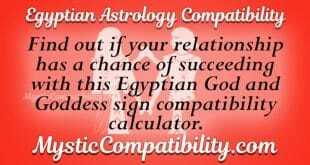 This implies that you ought to take the flames love test calculator today and unveil information that you were never aware of about your relationship.